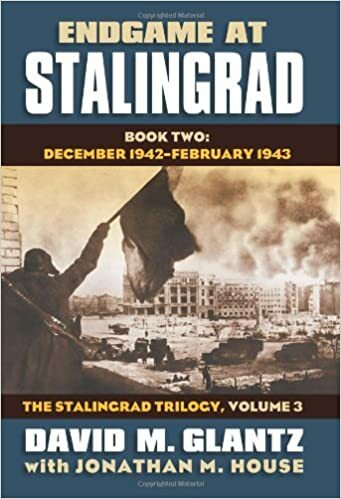 In Book Two of the third volume of his magisterial Stalingrad Trilogy, David Glantz continues and concludes his definitive history of one of the most infamous battles of World War Two, the Stalingrad campaign that signaled Germany�s failure on the Eastern Front and marked a turning point in the war. Book Two finds Germany�s most famous army�General Friedrich Paulus�s Sixth�in dire straits, trapped in the Stalingrad kessel, or pocket, by a Red Army that has seized the initiative in what the Soviets now term the Great Patriotic War. The Red Army�s counteroffensive, Operation Uranus, is well underway, having largely destroyed the bulk of two Romanian armies and encircled the German Sixth and half of the German Fourth Panzer Army. Drawing on materials previously unavailable or believed lost, Glantz gives a closely observed account of the final ten weeks of Germany�s ill-fated Stalingrad campaign. In short order, the Red Army parried and then defeated two German attempts to rescue the Sixth Army, crushed the Italian Eighth and Hungarian Second Armies, severely damaged the German Fourth Panzer and Second Armies, and finally destroyed the German Sixth Army in the ruins of Stalingrad. With well over half-a-million soldiers torn from its order of battle, Hitler�s Axis could only watch in horror as its status abruptly changed from victor to vanquished. This book completes a vivid and detailed picture of the Axis defeat that would prove decisive as a catastrophe from which Germany and its Wehrmacht could never recover. As in the preceding volumes, Glantz extensively mines newly available materials to provide a clearer and more accurate picture of what actually happened at Stalingrad at this crucial moment in World War II�a �ground truth� that gets beyond the myths and misinformation surrounding this historic confrontation. And this concluding chapter, relating events even more steeped in myth than those that came before, is especially bracing as it takes on controversial questions about why Operation Uranus succeeded and the German relief attempts failed, whether the Sixth Army could have escaped encirclement or been rescued, and who, finally was most responsible for its ultimate defeat. The answers Glantz provides, embedded in a fully-realized account of the endgame at Stalingrad, make this book the last word on one of history�s epic clashes.